CreamBar officially opened on Thursday, September 15. I have to admit, as soon as a co-worker told me about it, I knew I wanted to be one of the first customers. And, so I was! I even beat my coworker to it – he went 3 hours later. Now, because I pretty much just wanted to get a decent sample of what they had to offer, Maeven and I ordered 3 sandwiches amongst ourselves. Don’t judge – we don’t regret a thing. Let’s focus on my personal favorite first: that blueberry muffin ice cream. 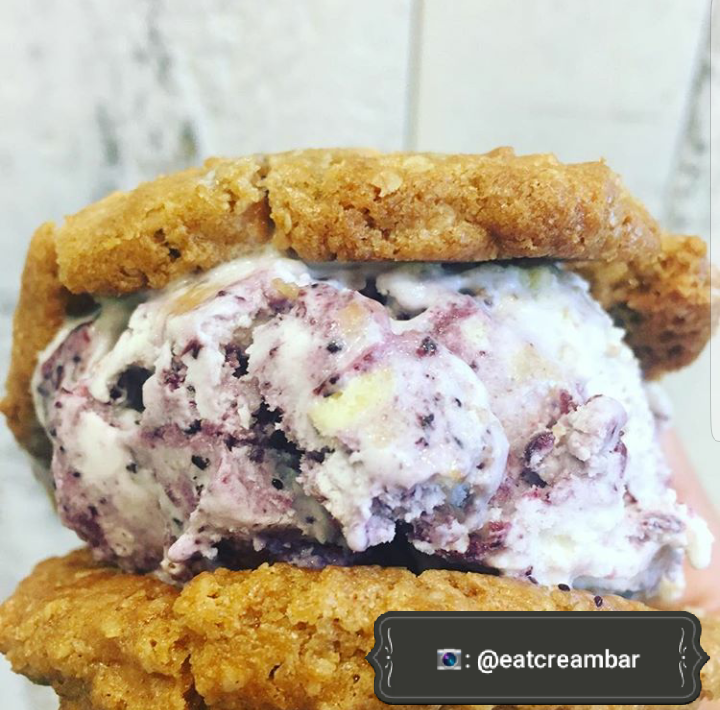 According to Brett, the owner, the ice cream they serve is actually made with blueberry muffin TOPS – the BEST part of the muffin (or at least, in my world it has always been). No wonder it tasted exactly like a blueberry muffin! 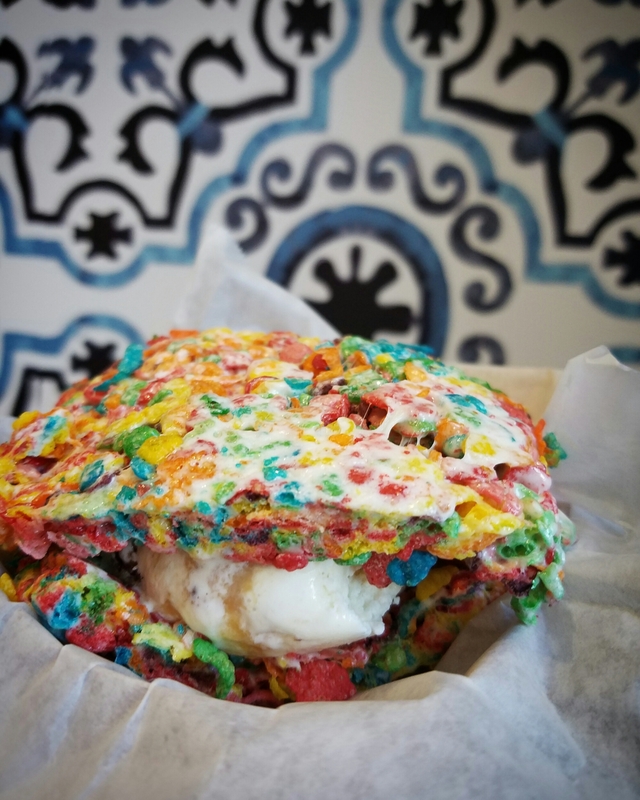 I decided on using a snickerdoodle because I went with a breakfast “theme” – the snickerdoodle cookie became a makeshift pancake for me, and the fruity pebbles are obviously the cereal portion of the morning routine. I have kids, but I’m also a kid at heart. Trust me, I can probably pass (not ACE, but pass) any Disney quiz you throw at me, and I can probably play make believe with just about any toddler that begs me to have a tea party. Stopping in at Cream Bar makes me feel like a kid. 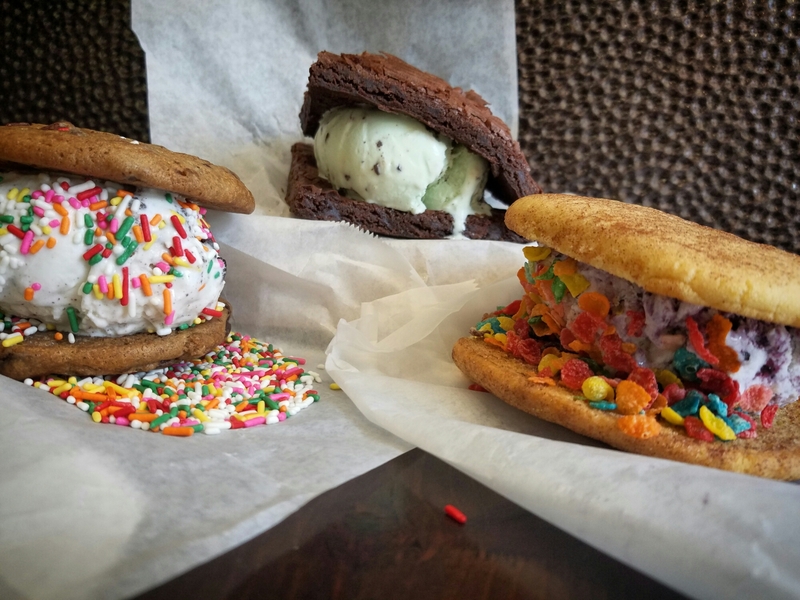 I can use my imagination and be as creative as I want to be with the cookie, ice cream, and topping combinations. *Disclaimer: Eat Play Chicago LA did not receive compensation for this post. All opinions are solely ours (well, mine anyway) and is not in any form biased.